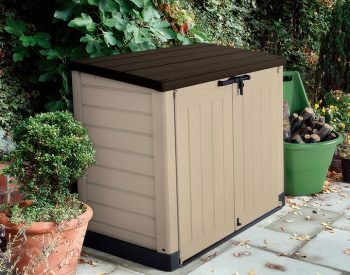 A very versatile unit, the KETER HIGH STORE, can be used to store 45 Kg gas bottles, garden tools, garden hoses, potting mix, step ladders, lawn mower etc etc, this is one of our favourite small sheds. 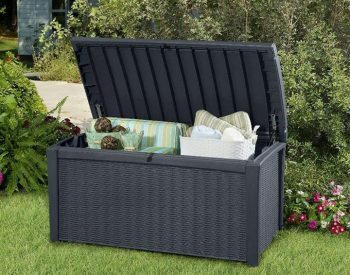 Keep the bugs out and your goods dry and dust free. Featuring an elegant, modern design with wood textured walls that you can even paint to match your home. High strength construction featuring thick, twin wall panels that make this unit one of the toughest Keter has ever made! 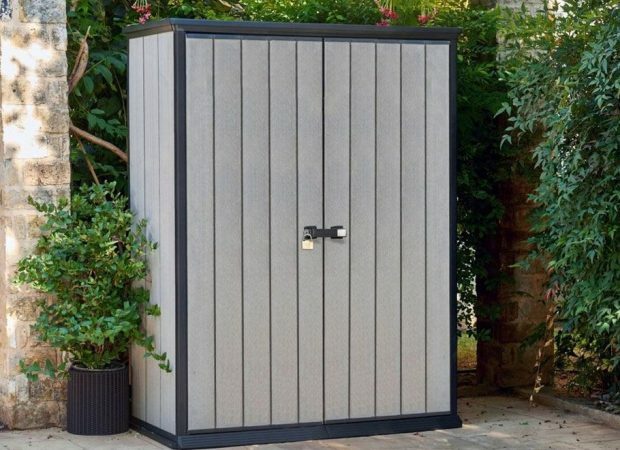 Completely weatherproof, this small shed makes for a very versatile storage space. The KETER HIGH STORE is the ultimate storage solution. 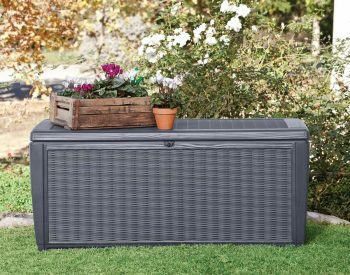 Spacious and sturdy, it can hold heavy equipment and garden supplies thanks to the heavy-duty floor panels. 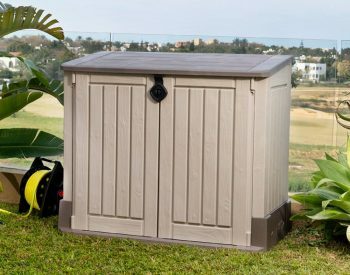 Made with rib-reinforced double walls and weather-resistant materials, the shed is durable and easy to maintain. It also features wide double doors, and a ramp like entry allowing wheeled items to be easily pushed in and out. 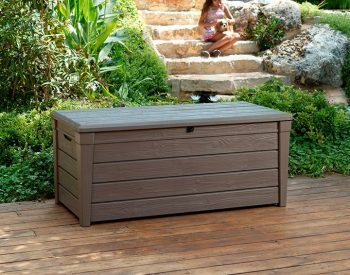 Durable and sturdy, perfect waterproof outdoor storage. 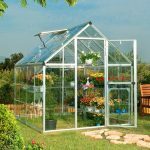 The sloped threshold will help you store and take out large equipment easily. Optional shelves available via the drop down options. Paintable walls allow for customisation. Very happy. 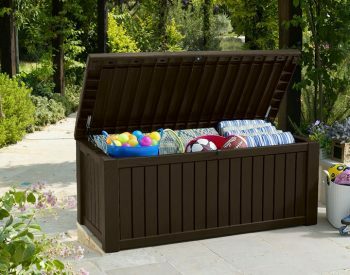 Great storage idea for small or large backyards. Easy to put together and looks great. Highly recommend. Keter High StoreThis is my first dealing with Landera, and I was very impressed. I first called them for advice on setup and quality of the Keter High Store unit, which they were only too happy to help me with. I ordered the unit online, and it arrived as stated 3 days later. Superb shed - easily movedWe’ve had our high store for over two years and it still looks new. When we moved house disassembly and rebuilding were much easier than expected and it has remained square and true. Wow. Awesome product. Great customer service. Arrived within days of ordering. Highly recommend. Keter High Store & ShelvesWe received our Keter High Store and Shelves very quickly, Landera was very easy to order with and was received within a few days of ordering. Very impressed with their service. 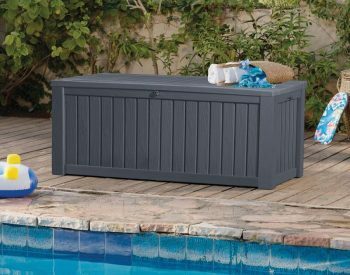 My husband and I assembled it easily with great assembly instructions, my husband kept commenting how clever the design of this product is, We are using this to store our pool equipment in, it looks great in the location near our pool. We also purchased the shelving for one half and left the other side for taller things. 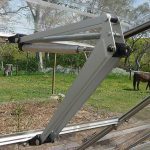 It is water tight and we do not have to worry about rusting as it is all plastic. We are really happy with this storage shed. 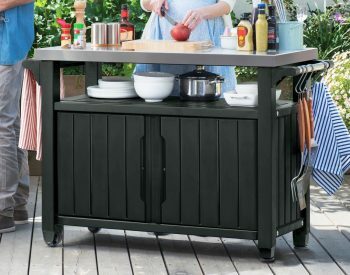 Keter products are really clever, we also have a Keter storage box and the Keter BBQ trolley. 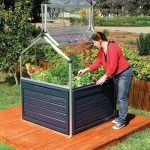 KETER HIGH STOREHad bought a KETER outdoor shed a while ago and needed to replace an old metal shed used for gardening equipment. Ordering was easy and delivery was on time. The High Store was easy to assemble, including shelves, and has done the job required keeping equipment safe and dry, whilst looking better than the previous metal shed. Second purchaseOrdered two Keter High Store units during the Christmas rush and they arrived within 6 working days, just in time for Christmas. As before, they were easy to assemble. I added three 1.3 m x 0.6 m shelves to one unit. Shelves took about half an hour each to make, and cost about $25-$30 each using materials from Bunnings. I added two 1.3 m x 0.3 m shelves to the other unit, so there is space in front of the shelves for rakes, brooms, etc. With these two units and the two I ordered previously, I now have just over 10 square metres of shelf/floor space to store stuff. I've been able to reclaim a room that used to be inaccessible because of all the stuff randomly piled up there, and now my stuff is easily accessible as well as nicely organised in my High Store units. Extremely happy with these units, will probably purchase again. 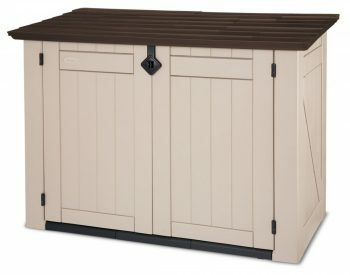 2nd time purchased!Had bought this model over a year ago and needed more outdoor storage. Was pleased with original purchase and had no issues with buying another one. Landera were prompt and efficient with delivery. Would recommend this product, was easy to assemble and has done the job required keeping things safe and dry outside. We have a small area in the courtyard that we have converted to storage with this great product. It is was delivered very quickly and was easy to assemble. Very happy with my sheds.Service is excellent. All my email enquiries were answered promptly. The two sheds I ordered late Monday were delivered to my home in Perth early Thursday the same week. I ordered these sheds because I wanted something easy to assemble that I could locate on paving under a carport and move around if necessary. The sheds are perfect! I have been looking for this type of storage solution for a long time. I am very happy with the sheds and plan to buy two more. The instructions are clear and easy to follow. Assembly is easy and quick -- the second shed took less than two and a half hours. The design is outstanding. The key parts are the moldings for the floor and roof, which are identical. Any small differences in length of the wall parts are masked by the roof piece. The doors fit nicely and pre-cut slots in the door pieces allow the hinges to be aligned easily. The sheds look very neat and clean once assembled, just like the ones on the website. With one shed I had two problems. The floor piece was not molded correctly; this did not affect assembly or appearance of the shed, but the floor feels a bit delicate when heavy things are placed on it, so I have covered it with a sheet of plywood to distribute weight more evenly. Two of the wall pieces were about 5 mm too short and I had to drill extra holes in the roof piece to allow the roof to be fixed to these wall pieces. Because of the way the shed is designed, both problems were very easy to fix. 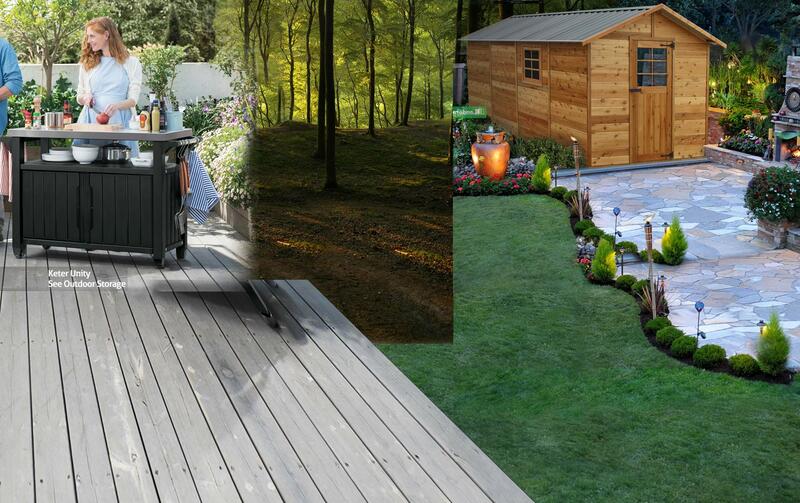 Love my Keter High StorePerfect solution for an attractive shed that adds a feature to a small outdoor space. Great that it can be painted and make the outdoor area pop! Shipping quick to Perth and instructions easy to follow, though another pair of hands was needed to keep stable during installation. Great little shedThis is an awesome little shed and really easy to assemble. Deliveey from Landera was quick, only 2 days. Great product and great serviceBest online shopping experience ever. Best online shopping experience ever. Got to be one of the easiest flat-packs I've assembled, and I've done my fair share! 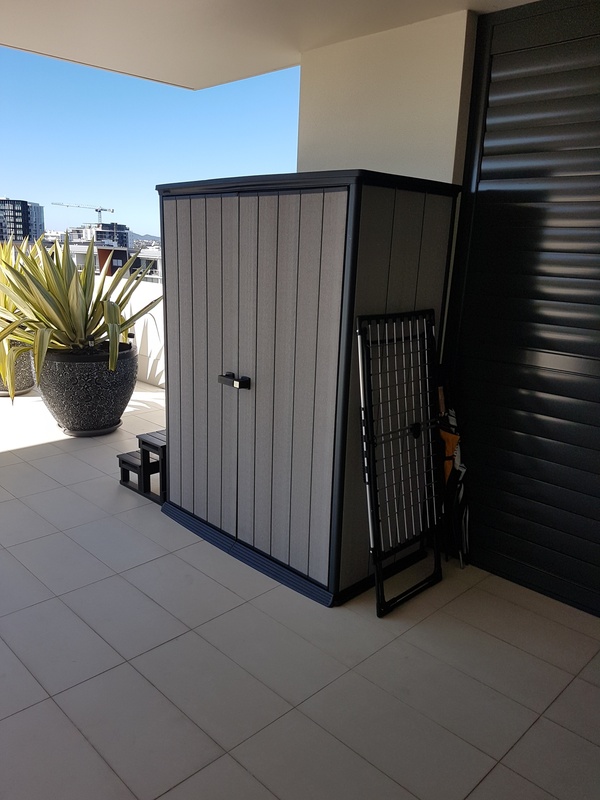 Superb solution to apartment living storage woes, neatly tucked onto a corner of the deck. 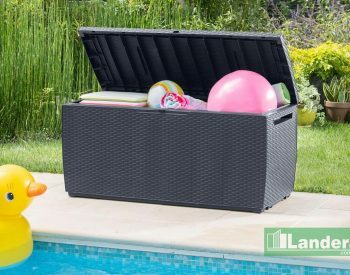 Fits the likes of a spare washing machine and storage boxes perfect, just the answer to our needs. Very easy to assemble. I did it myself, no need for 2 people. Looks great. One tip, make sure you assemble on the final surface to ensure it sits evenly. Also, it comes with 2 sets of shelf brackets if you want to make your own from a piece of timber from Bunnings. Purchased two Keter High Stores and installed them back to back for an efficient and compact storage space. The product was well packaged for transport with all parts clearly labelled inside making for an easy build. Pictogram instructions were easy to follow and tools required were minimal. I would recommend this store for anyone requiring a compact, secure and weather proof store. Good instructions detailed with pictures, every item labeled. Took my son and I about 3 hours to put together. Looks great and seems sturdy. 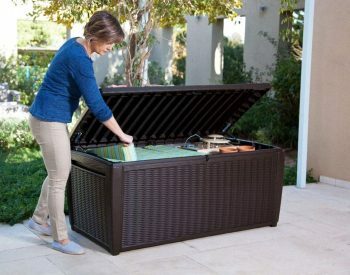 Just what I needed for some much needed outdoor storage. Thanks! Fantastic storage solution for apartment dwellers! 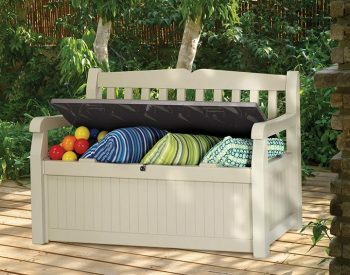 Heaps of storage, looks great and easy to assemble and disassemble!